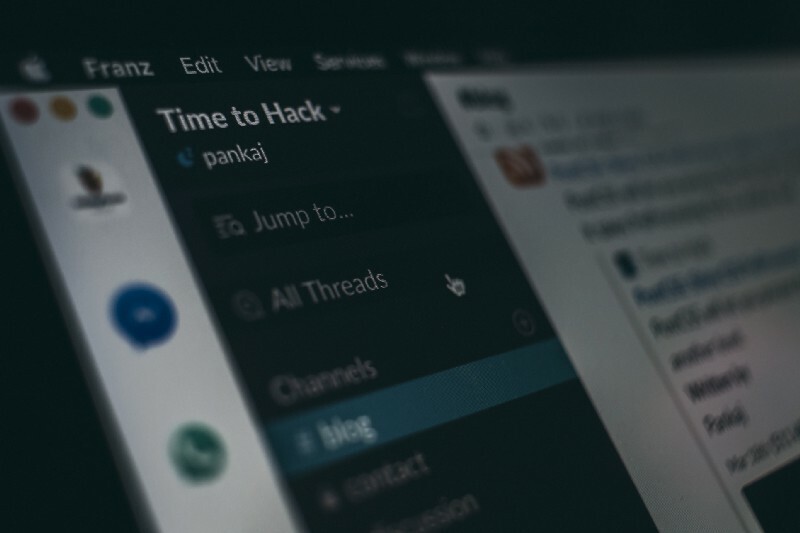 Slack is a popular real-time messaging tool used by many companies, organizations, and teams for communication. Teamup provides an integration with Slack so you can receive calendar notifications within Slack. If you’re already using Slack throughout the day to communicate, it’s nice to get your calendar notifications in Slack, as well. Once you’ve set up a private channel integration, you can opt to receive push notifications via Slack. Since Teamup currently does not support push notifications (it’s in the works), this is a good alternative. See these instructions if you want to enable notifications for a group channel in your Slack workspace. When using Slack for a private channel, you can use your personal calendar link to create notifications. Since the channel is private, the link used will also remain private. You don’t need to be a calendar administrator to set up notifications to a private Slack channel. Step 1: Access the Slack integration option. 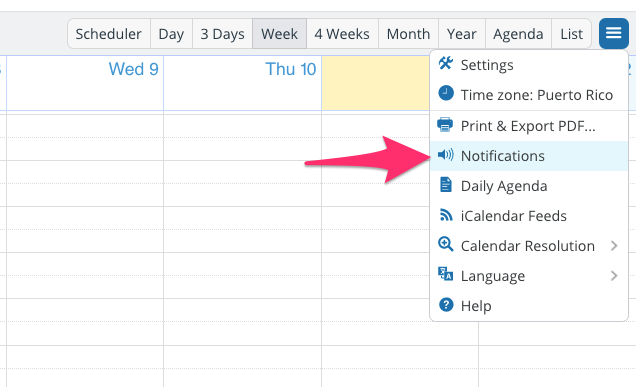 In the menu (top right corner of your calendar), click Notifications. Note: If this item is greyed out, the administrator of your calendar has disabled notifications for non-administrator users. You’ll need to contact your calendar administrator and ask them to enable notifications. Click on Notifications in the calendar menu. 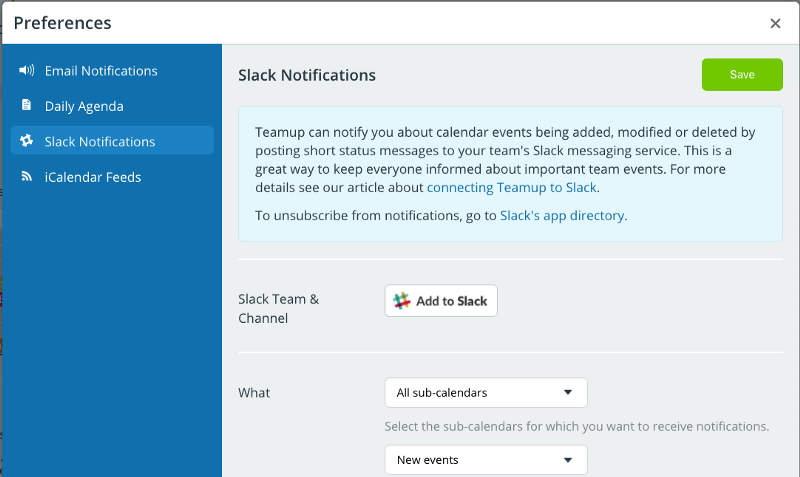 Click on Slack Notifications to integrate Slack with your Teamup calendar. Step 2: Obtain Slack authorization. Click the Add to Slack button. This will take you to Slack.com to obtain the necessary authorization. Choose the Slack Team and Channel you want to use. Select the Slack team that you want to integrate, and select Slackbot (which is private to you), or select your personal channel. 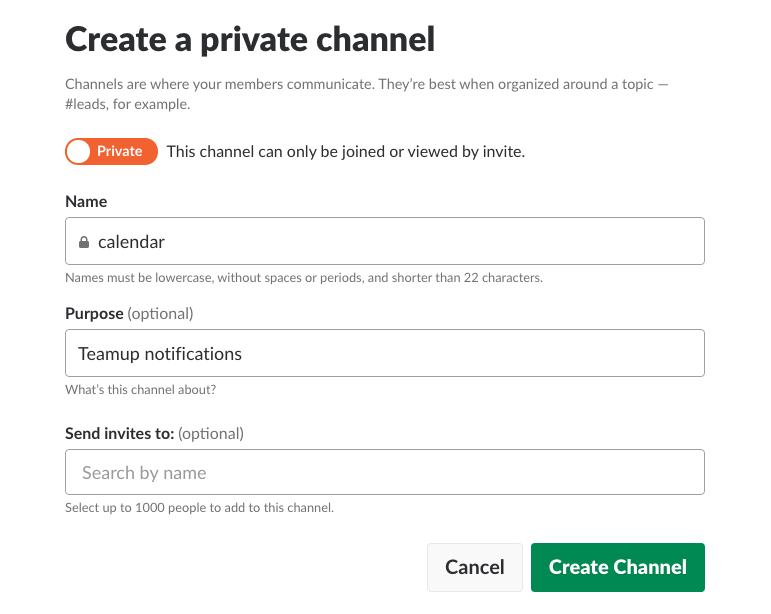 You can also set up a new private channel in Slack for your calendar notifications. This makes it easy to review the changes that have occurred to your calendar and keep these notifications separate from other information you keep on Slack. Choose a private channel to keep your calendar link secure. Once you’ve chosen an appropriate private channel, click the Authorize button to give Teamup permission to post messages to your selected Slack channel. Now you will be redirected back to the Preferences window, to choose the sub-calendars and events you want to include in your Slack notifications. Step 3: Set your notification preferences. Select the sub-calendars you want to include in Slack notifications. Then you’ll choose the type of events. 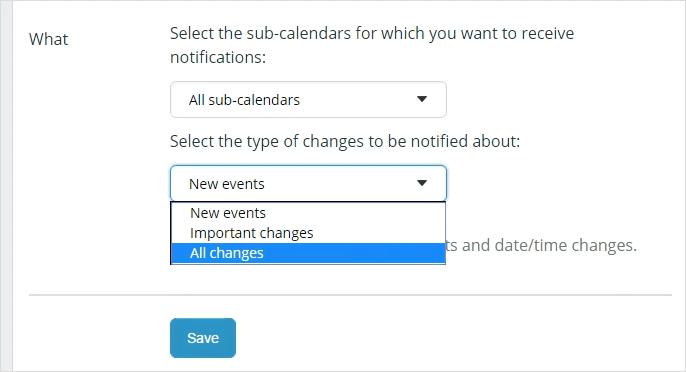 You can select New events, Important changes, or All changes. Important changes include new events and date/time changes. Note that changes of past events will only trigger notifications if the calendar is on a Premium plan. When done, click the Save button. You’re all set! Here are additional instructions for using Slack in a private channel. Of course, we’re always here to help. If you have questions that aren’t answered here, get in touch with us. Header image by Pankaj Patel on Unsplash.